Hundreds of passengers had to be transferred from a ferry that was blown back on to its berth by gale force winds today. 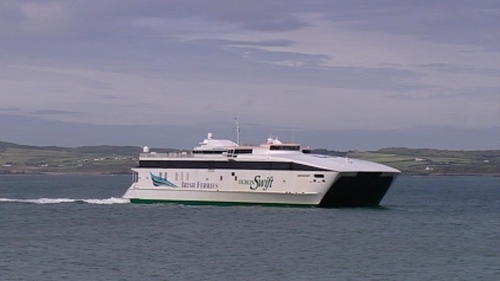 The Irish Ferries Jonathan Swift vessel, a fast service across the Irish Sea, was preparing to set off from Holyhead to Dublin before midday when heavy gusts pushed it back against the dock. 650 people on board were transferred to another service as a precaution. A spokesman for Irish Ferries said the aluminium hull ferry was being inspected to assess damage to the body and replacement services will take passengers to Dublin during the day. "Just as she was leaving the berth at Holyhead she was caught by a gust of wind and blown back in. She was only yards off the berth and the ropes had been loosened," he said. Irish Ferries cancelled three Swift services following the incident. The first weekend in August was met with a weather warning by forecasters, with gale force winds gusting to 100km/h along some parts of the west coast over the past 24 hours. Meanwhile in Tramore Co Waterford, kite-surfer Sean Murphy carried out a daring jump during the strong winds.